It’s a Matty D Guarantee. My picks will finish the season with an above .500 record. If you’re a new visitor to my blog, I make five predictions every Saturday for college basketball. I use the Vegas odds as my guide. Because, well, there’s no skill in predicting that a 26 point favorite (see Kentucky over Auburn) will win a game. After suffering my first 1-4 week of the season, I rebounded on Valentine’s Day. I have scored back-to-back 4-1 weekends. My record for the season stands at 35-19 (with one tie). If you’re on Twitter, check out a log of my predictions by searching the hashtag #SuspectSpreadsSaturday. I expose what Las Vegas odds are “suspect,” as in questionable in nature. You get it. Matty D Guarantee Warning (almost) in full effect. It’s not March, just yet. The Johnnies went into Washington, D.C. riding a three game winning streak. First and foremost: the A team of all College Basketball A Teams, Gus Johnson and Bill Raftery, were on the Fox Sports 1 call. Secondly, the first half told the full tale of the tape. Seldom-used Florida International transfer Joey De La Rosa got the start against a like-bodied, thick Josh Smith. In the beginning sequences, the big bodies banged equally against each other. They essentially canceled each other out and the tone was set as a perimeter/transition game. I have been questioning what’s happened to former starting St. John’s center Chris Obekpa. A friend on Twitter tells me he’s been hobbled by an ankle injury. If D’Angelo Harrison was the soul of this quad, Obekpa had been the heart. Yet, he hasn’t played in all but 35 minutes in 4 games since an elbow disqualified him in a game against Butler. Obekpa just played 13 minutes against Georgetown. He is a 6’10” junior from Nigeria. Isaac Copeland was aggressive early for Georgetown. This kid played the power forward as a small lineup was trotted out there with Smith in early foul trouble. Copeland finished with 11 points. Neither team could buy a bucket in the early going. Obekpa entered the game at the 15:15 mark while St. John’s trailed just 5-2. He quickly left the game after a back-and-forth tempo put the game at an 11-7 Georgetown advantage. The center from Rome, Italy Amar Alibegovic saw some minutes immediately. Alibegovic hit a three-pointer in transition and fed a three-point basket from a post assist on consecutive possessions. De La Rosa returned at the 11 minute mark (still first half). Alibegovic stayed in, giving St. John’s a rare zone defense with a unique combination of players. Smith missed a jump-hook in one possession, but the Hoyas quickly gobbled up an offensive rebound after the post defense had sucked in. Alibegovic answered with a dunk in transition. De La Rosa logged 3 fouls in 12 minutes. 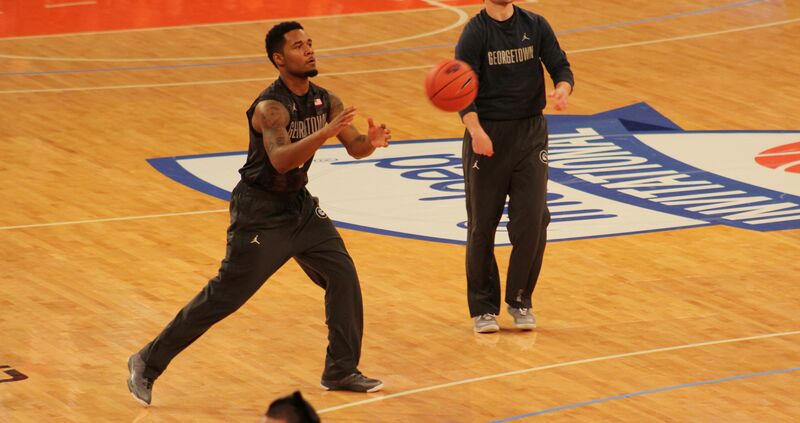 As Gus Johnson points out, Georgetown is still in need of a point guard. The eye test tells you that Smith-Rivera and Trawick are shooting guards chipping in at point. Smith-Rivera completed the game with 6 assists, so there was no shortage of sharing. In an extremely upbeat first half, Georgetown finished a majority of drives. A Mikael Hoplins dunk on a transition put back put the Hoyas up 26-19, capping an 11-0 run. Georgetown led at haltime 33-23. The Hoyas held D’Angelo Harrison (4th all-time career scorer at St. John’s) to 0-5 shooting from the field. Rysheed Jordan was also held scoreless in the first half. St. John’s turned the ball over 12 times resulting in 13 transition points. Georgetown won by a final score, 79-57. So there I was, gliding along on the season with my predictions. I tweeted smack talk, saying how I was 66% correct on the season (26-13). That’s when the full court press caught me. Like a stunned offense in front of the Cameron Crazies, I needed a timeout. I licked my wounds, re-watched tape, and debrief on two of my worst losses. You can see my posts about what SMU and Stl John’s taught me by picking against them. This week I will tone it down in attitude and rely on “what got me here.” My eye test still hasn’t failed me. I can live with a 27-17 record, for now. This week I would like to take Old Dominion getting 4 1/2 points at UTEP, but I just haven’t seen enough of either team. VCU has lost a couple times since losing Briante Weber. Conference rivals like Dayton, George Washington and Temple have been eager to seize the moment. I trust point guard Joe McDonald to handle the Havoc defense. I see the Eric Snow play-alike to capture this win. In a pick ’em, I have to take George Washington as an “icing on the cake” for their testimony towards postseason. I like Michigan State to actually cover 2 1/2 points against Ohio State. I keep looking at that line thinking Ohio State is a gimme, but I think that coach Tom Izzo will find a answer to De’Angelo Russell. I think a Spartans win would be the “icing on the cake,” for Michigan State to be an official pain in the committee’s decision-making behind. Can you envision Tom Izzo’s team in the NIT? Give me St. John’s getting eight. They’re on Joe Lunardi’s latest bracket as a play-in 12 seed. A win *at Xavier would be the icing on the cake for the Storm to stay on that inside the bubble fold. Iowa State is a 3 or 4 seed. It’s much more dangerous to be a 5 or 6 seed. Saturday will be the icing on the cake for Iowas State to separate its cream from the crop of Big 12 teams. I think they’ll throttle West Virginia. And, finally, Villanova is in similar position as are the Iowa State Cyclones. Villanova beat a quality Providence team wire-to-wire the other night. I expect the Wildcats to hold serve and hold on to that projected 2 seed in the NCAA Tournament. A win at Butler would all but guarantee this, especially if they par-out the rest of the way. Give me Villanova minus two points. St. Mary’s or BY whU ‘Ya Got? Yeah, yeah. We know all about Gonzaga. Most athletic Zaga squad ever, all the size you’d want, Kyle Wiltjer gained Herculean strength during his year off. But AT LEAST one other WCC team will make the NCAA Tournament. BYU or St. Mary’s: Who YOU got? After watching the first of two games this season, I blogged about how both teams could make a Sweet 16 run. St. Mary’s was the more impressive, but BYU was also down a man. Click here to read my full game recap from mid-January. In the second game between these two teams, BYU again proved that it can score in transition. On the flip side, BYU does not get much offensive production on its offensive front court. On the defensive end, much of the same. At least the Cougars switch up their defensive schemes, double-team, help defense and try to confuse. If BYU plays another quality shooting team in March; say an Ohio State, Arkansas, Indiana or North Carolina, take the over. For storylines, you’d take St. Mary’s. They have five veteran seniors with serious “skin in the game.” One, point guard Aaron Bright was the 2012 NIT MVP with Stanford. The next season he dislocated a shoulder and missed an entire season. With Stanford point guard Chasson Randle coming up, Bright transferred to St. Mary’s in 2013. He’s now 22-years-old. Second, back-court mate Kerry Carter also took five years to ripen after three years at Citrus College of the Western State Conference. Third, small forward Garrett Jackson started his collegiate career at USC. You’ll see him doing the dirty work now for the Gaels. However, he was once a prized recruit for the Golden State. Jackson was ranked 82nd overall by ESPNU when he came out in 2010. Fourth, power forward Desmond Simmons played all his years at Washington under coach Lorenzo Romar. Now he’s using his last year of eligibility for this run. And, finally, Brad Waldo. This center reminds me of a mixture of Brad Daugherty and Bryant Reeves. This version of “Big Country” has been a mainstay with the Gaels, even since they topped Gonzaga in the regular season in the 2010-2011 campaign. But, by the eye test, I can’t ignore BYU’s offensive skills. St. Mary’s guards are undersized when combined. If Waldo is not effective, it could be a long night. I really like the activity level of BYU from the perimeter. They led St. Mary’s 75-45 with its full compliment of players. Note: neither BYU or St. Mary’s are on Joe Lunardi’s latest edition of bracketology.